Institute of Philosophy of Slovak Academy of Sciences is a publisher of two philosphical journals, Filozofia, a journal open to a broad spectrum of philosophical ideas and methodologies, and Organon F, a journal devoted to analytic philosophy, philosophy of science and logic. 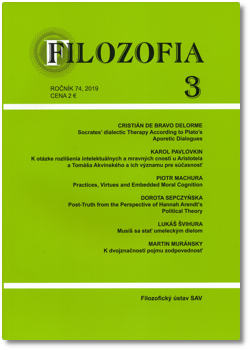 Filozofia publishes original articles in a wide range of areas including metaphysics, epistemology, history of philosophy, social and political philosophy, philosophy of mind, ethics, philosophy of religion and related disciplines. The journal is published monthly, with the exception of July and August, i.e. ten issues yearly. The articles are accepted in Slovak, Czech and English languages. Organon F is an international journal of analytic philosophy. It publishes articles that address the whole range of topics discussed in contemporary analytic philosophy. Accordingly, the Journal invites articles including, but not limited to, philosophy of language, philosophy of mind, philosophy of science, epistemology, ontology, philosophical logic, etc. Occasionally, it publishes also analytic articles on ethics, aesthetics, social philosophy as well as history of philosophy and logic. Organon F appears quarterly (in February, May, August and November).